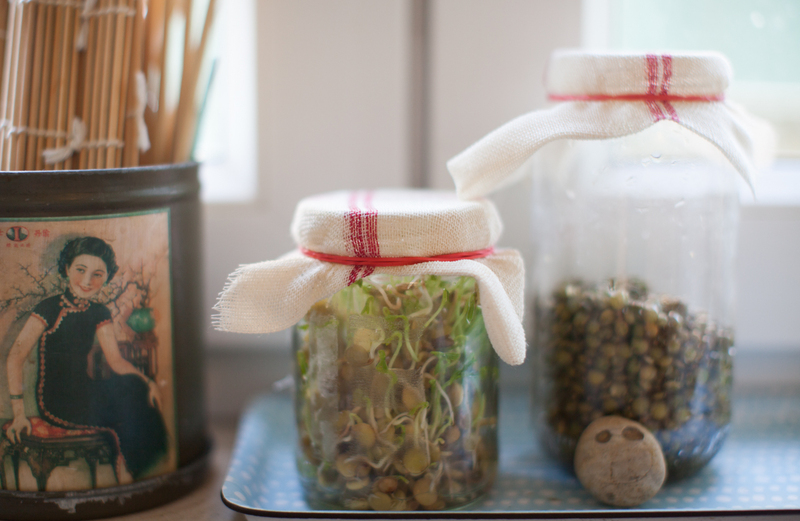 What to do with those dried lentils in your pantry… Sprout them! Add then them to salads, eat them as a snack, add them to smoothies or use them as micro greens in the winter (if you can’t grow your own salad due lack of light). They have a mild and slightly nutty flavour. Delicious! And so healthy… Try doing it with the kids: they will love seeing it grow so fast! I’m cautious to what goes into my body nowadays, especially since I became a vegetarian two years ago. I like to eat “real food”, by that I mean that I avoid processed food, even for vegetarians and vegans. I want to make all the food I eat by myself. I buy organic produce, or grow as much as I can in my garden, I buy local and seasonal. I never thought it was difficult to quit the meat though, as there are so much delicious stuff to replace it with. And replacing the meat really helps our health and also the environment. What’s also interesting is that blood tests I’ve done lately shows that my iron and protein levels are so much better now since before, when I still ate meat. Anyway, my new favourite source of protein nowadays are lentils and beans. I make salads with boiled lentils together with chopped red onions and add a really tasty sesame dressing (2 tbsp brown sugar, 2 tbsp Japanese soya sauce, 4 tbsp toasted sesame seeds and 4 tbsp tahini sauce). 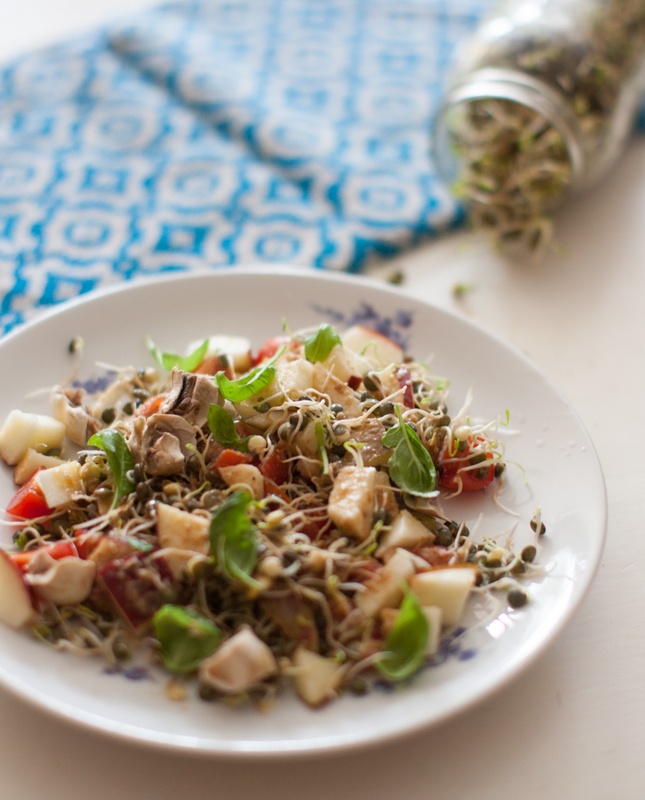 Or you can make this quick salad dish above from sprouted lentils: a chopped up apple from the garden, sprouted lentils, cherry tomatoes and some basil leaves. And again, the sesame dressing. Yummie! – a loosely woven piece of cloth (like cheese cloth, but any cover that lets out water will do, a small sieve for example). – lentils: black, red, green… any kind will do. – rinse and put the lentils in your jar. – add water almost to the top, grab the cheese cloth and attach it on the top with the rubber band. Keep it close by so that you don’t forget about them. I keep my jars in the kitchen, by the window, as that’s where I am several times per day. – in the morning, add water through the fabric, and shake them lightly, then remove the water again. They need to constantly stay moist, but not wet. – keep adding water, shake and remove for a few days. Morning and night will do. 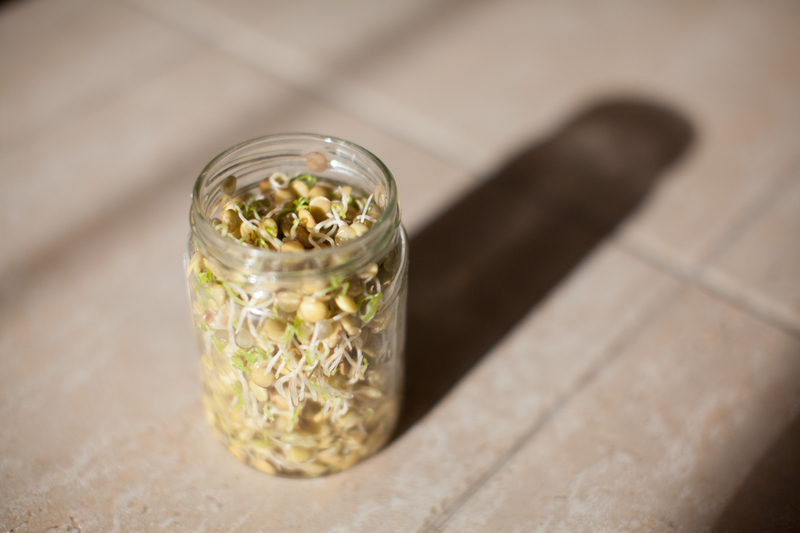 It will take about 2-3 days until your sprouts are ready to eat, but you can leave them to grow as big as you want them.